Inside the <canvas> tag, you can put any HTML code you wish. 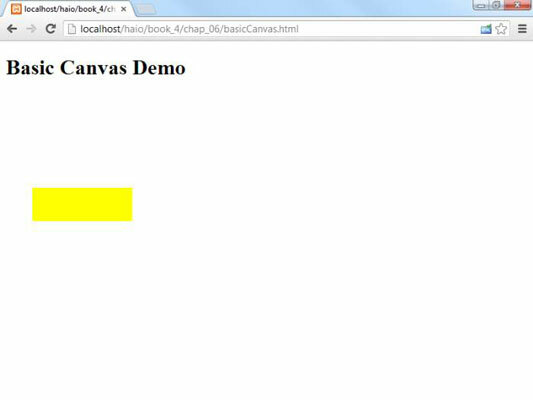 This code will appear if the browser does not support the <canvas> tag. Typically, you’ll just put some sort of message letting the user know what she’s missing. Create a variable reference to the canvas: Use the standard getElementById() mechanism to create a variable referring to the canvas. Extract the graphics context from the canvas: Canvas elements have a graphics context, which is a special object that encapsulates all the drawing methods the canvas can perform. Most browsers support a 2D context now, but 3D contexts are beginning to appear as well. Set the context’s fillStyle: The fillStyle indicates how you will color filled-in areas (like rectangles). The basic approach is to supply a CSS color value. Create a filled-in rectangle: The graphics context has a few built-in shapes. The rectangle shape is pretty easy to build. It expects four parameters: x, y, width, and height. The x and y parameters indicate the position of the rectangle’s top left corner, and the height and width parameters indicate the size of the rectangle. All measurements are in pixels.